These words, written by Marcus Aurelius nearly two millennia ago, cut to the core of what it means to live a good life – it isn’t what we say that defines our character, it’s what we do. Today, in a society obsessed with content, outrage, and drama, it’s easy to get lost in the echo chamber of the debate of what’s “better.” We can have endless discussions about what’s right and wrong. What’s a‘man?’ What does it mean to be a feminist? What should we do in this hypothetical situation or that one? How can we encourage other people to be better? Of course, this is all a distraction. A blog comment takes a lot less work–and means a lot less–than living those ideas to the best of one’s ability. If you want to try to make world a slightly better place, there’s a lot you do. Only one guarantees an impact. To lead by example is what Aurelius was trying hard to remind himself when he wrote these words in Meditations, originally intended only for his own reflection. Centuries later, we could all use more ways to remind ourselves of this universal truth. That’s why we’re excited to announce a beautiful way to memorialize these words and to create a vivid and inspiring way to be reminded of them everyday. 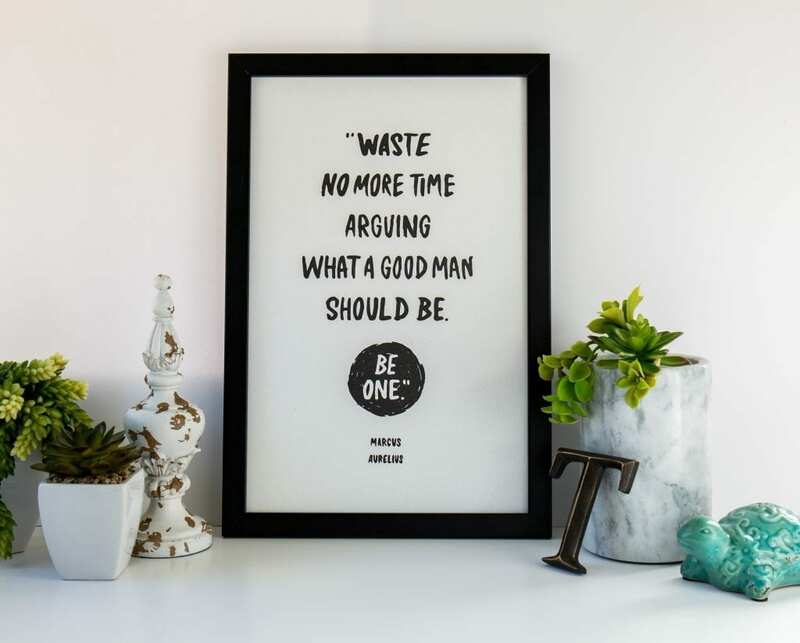 In collaboration with the acclaimed artist Nick van Hofwegen (PKA Young & Sick, creator of album covers for multiple Grammy award winning musicians like Foster the People, Maroon 5, and Robin Thicke), Daily Stoic has produced an exclusive and limited edition 11×17 print of Marcus Aurelius’s essential maxim. Each print is made in San Francisco using the centuries old letterpress technique, stamping each word into the paper to give incredible detail and texture. Whether framed in your hallway to give you inspiration as you head out each day, or taken to the office to inspire your team, these prints make a lasting impression on spaces and the people who occupy them.